A very shabby BB67626 passes Larronville, north of Rue with the 14:46 Boulogne Ville - Paris which it will work to Amiens. No trains today, but still the start of the trip. Today was very much a positioning move, leaving home to drive down to Dover for the boat across to France and then on to Amiens. Fortunately the Easter holidays permitted the roads to be kind to us and our rather tight timings to get to Dover proved to be no problem at all. P&O were not doing quite so well and the 'Pride of Kent' was over 30 minutes late by the time it left on the 20:15 sailing to Calais. By the time we reached Calais it was gone 23:00 French time. Arrival at the Holiday Inn Amiens was shortly after 01:00. I've always had a good stay here in the past though there was a bit of confusion over my booking- I had booked a double? I don't think so... some sort of discrepancy between what the booking agency had booked and what I actually had booked. Anyway- it was sort of solved by separating beds and some extra sheets! BB15048 pauses at Longeau with the 09:10 Amiens - Paris Nord. Given the arrival time the previous night it was decided to have a more leisurely start to the day, enjoying the available breakfast and then picking up a quick move on the Boulogne line before taking the train into Paris. Tickets were purchased on FIP for Amiens-Longeau-Abbeville-Paris-Amiens (which the ticket clerk managed without too much questioning our sanity) however there was instant concern that the train out to Boulogne was showing 10 minutes late. It should be a +20 connection into the next train back to Paris so wasn't too much of a concern yet. 15048 was taken on a quick hop down to Longeau on the 09:10 Amiens - Paris. reverses back to wards Longeau depot. By arrival time at Longeau the Boulogne train has manged to become 15 late... still, should be fine for a +20, and plenty of time to make some of that up in the loco change at Amiens we thought. 22346 sure enough arrived with the 08:28 from Paris, around 15 down. We took this to Amiens still with full intention of continuing to Abbeville. Winner 67408 was sitting next to the train on arrival and all we need was a speedy loco swap to get us up the line for our connection back onto the Paris train- it wasn't to be. It looked like the electric was ready to come straight off the train, but then 5 minutes later the staff actually decided to uncouple it. When the loco eventually pulled off the train it was the slowest move I have EVER seen taking several minutes to clear the points at the end of the platform. If it was less than 20 minutes late leaving we should still make the connection... the diesel backed on, and the train still didn't have the road to proceed. At 19 minutes late we disembarked the +20 having reduced to a +1 (with a very long fester at Abeville if it missed). Eventually the train did leave, but again at less than walking pace taking a whole 4 minutes to clear the end of the platform (I guess there must have been some sort of traffic with a speed restriction). By the time the train had actually left the station it was 24 minutes late. 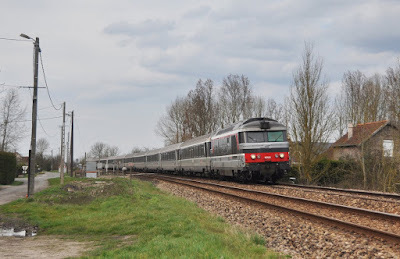 Congratulations to SNCF for managing to turn our first +20 connection into a -4 and causing us to abandon our only diesel hauled move of the trip! Ah well... Plan B it was then, taking the 10:38 Intercity in to Paris, with now dud 22346! Cheers! We took this to Creil for a go at the 17000's on the line to Pontoise. Quing to buy our tickts for the hop to Persan-Beaumont took most of our 20 minute connection here, but we did make it onto 17069. We had just time to buy our 1-5 mobilis tickets at Persan Beaumont before hopping back on the train to continue our plan to get 4 of the loco's in. Only there wasn't a train advertised forward to Pontoise... and ours was shown going back to Creil. Ah- the train to Pontoise would be that bus. Excellent. We hadn't checked this route for digging! Plan C it was then. Back to Boran-sur-Oise to pick up 17055, the only other loco out (they were at least both winners). With a 2 hour gap until the next train back to Creil the only option was a fast unit into Nord while we worked on another new plan. Persan-Beaumont. Seen here at Boran-sur-Oise. with a northbound working in gloomy conditions. Down to Gare de Lyon to have a go on the 7200's out to Melun (we might as well get some use out of our Mobilis tickets!). This produced 7236 on the 14:49 for 7241 (my first dud loco of the day) on the 15:46 back from Melun. At Gare de Lyon was a long rake of older coaches forming some sort of 'Euro 2016' exhibition train. We couldn't get anywhere near it as the platform was fenced off, but it was something different. Next move was to get across to Nogent le Perreaux for some CC72100's on the viaduct- however once we had got to Val de Fontenay to change trains it became apparent that the weather had now descended so much that it really wasn't worth the effort anymore. CC72177 was seen here with the 16:42 Paris - Belfort and CC72121 was seen shortly after with the 13:20 Belfort - Paris. Really it hadn't been worth bothering the light was now so poor. There is now only one BB8500 booked out of Paris on a Saturday, on the 18:09 to Chartres so we thought we'd give this a go. Fortunately it was another winner with 8596 which was taken to Versailles. The station here has been completely refurbished since my last visit, and I must say looks superp (it certainly needed it). A new footbridge has been constructed separately at the country end of the station and looks to be almost finished (but not open yet). It hadn't been an awful day despite the weather and the failure of both plans A and B. We just needed to find a winner to get back to Paris now. 7606 should have been the answer but having sat on the train for a few minutes it appeared to be going nowhere... so we hopped off for a phot- during which time with no warning the doors closed and off it went! Fortunately it wasn't too long to wait for 27325 which also required the red pen. 'Concrete' locos side by side at Paris Nord. Less 'ghosts' were seen on this trip. Dinner was taken close to the Sacre Cour (I do like to be a tourist for at least a short time on this trips to Paris!) before 15041 was taken on the last train to Amiens, the 22:28. There was a bit of a flap at the ticket barrier where there were about 20 police and SNCF officials who seemed to have erected a barrier line preventing people from boarding the train. We watched somebody being forcibly ejected from the platform. Slightly concerned we approached one of the officials, tickets in hand and 'Amiens' in tongue to be let through with no problems. The train was right on time (as was everything else except the Boulogne train in the morning) and we were back in the Holiday Inn by midnight- earlier than the previous day at least! BB22229 nears Longeau with the 08:04 Paris Nord - Amiens. with the 09:34 Boulogne - Paris finally in some good light. Hoping for some better weather we were slightly put out to wake again to overcast skies. Still- the show must go on as they say and to our amazement just minutes before we arrived in the car at our morning location just south of Dammatin on the line to Paris. We have three trains to watch here, BB22200's on the 08:38 Amiens - Paris (BB22342), the 08:04 Paris - Ameins 22229 and then 150059 on the 09:17 Amiens Paris. Some good photos ensued (except the one my camera didn't focus on) and we were certainly glad to have made the effort. Next the main purpose of the trip would begin- chasing the Boulogne diesels. BB67609 was photographed near Conde-Folie with the 09:34 Boulogne - Amiens. The sun was still shining as we then started to drive up to Noyelles for a run on the Baie de Somme railway (this nicely filling in the long gap until the next Southbound train). Unfortunately Plan A failed us again as there simply wasn't time to get to Noyelles for the steam! Even if we hadn't got stuck behind a slow ambulance and been stopped for an organised walk to cross the road I still don't think we'd have made it. We diverted to St Valerie to photograph the train we should have been on, and then attempted to park- which proved somewhat difficult as the town was absolutely heaving. Finally parked the next issue was paying... I had no coins. Fortunately I managed to buy some sweets for a nearby shop to get a few coins- but the shopkeeper kindly refused to give me my 5 euro change in anything other than a note. Cheers! Fortuitously we just made the 12:20 diesel run down to Cayeux with 351. It wasn't the plan but was quite enjoyable. Lunch in Cayeux before the return trip. We had expected this to connect into the steam train back to Noyelles- but the connection wasn't held (I'm sure if it had been essential to get it we could have shouted a bit as it only missed by 30 seconds!). Still- the car wasn't in Noyelles so no problem. Back to the big diesels and an extremely shabby BB67626 was photographed just north of Rue on the 14:46 from Boulogne with BB67609 passing shortly after on the 14:51 Amiens - Boulogne. The next train was BB67408 on the 16:33 from Boulogne photographed near Ponthoile (north of Noyelles), before this 66228 was photographed with a southbound stone working. 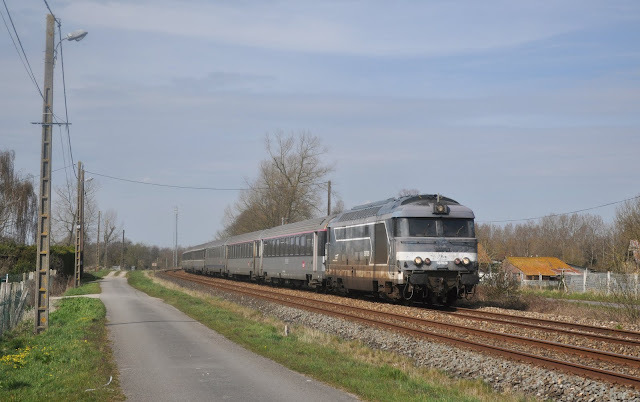 Another stone train followed with an ECR 66 (not identified) before our final photo of the trip with BB67431 on the 17:33 (18:01 on the diagrams) Boulogne - Amiens North of Noyelles. The full sun had gone for the last two trains but we were still happy with our helpings for the day. All that was left now was to get back to Calis for the 20:25 sailing back to Dover with the 'Pride of Canterbury'. waited for the diesels just north of Noyelles. In conclusion the trip certainly had its frustrations, the missed connection, digging, and weather (well, I can't blame that one on SNCF!). However the Boulogne line is still great for photographers and like I said after my previous driving trip to the line two years ago I wouldn't rule out another visit, especially as the Regiolis units have been banished (for now). There are some great locations you can get to very easily with a car, Again I found some new ones in the Noyelles area and there are still many I've yet to explore between Abbeville and Amiens. There are some 'new' locos currently working out of Longeau with several of the examples we saw having recently moved up from Bordeaux or Chambery. On another note *almost* all the locos we saw in Paris on this trip were in actual liveries- the previous trip was plagued by most of them being 'ghosts'- particularly on the Paris - Amiens route only two 'ghost' BB22000's were seen with all others being in the original 'concrete' scheme. Also for the first time the Boulogne line failed to produce all three common BB67400 liveries with no appearance of 'En Voyage'. Security was more noticeable than on my previous trip with armed police and army at several stations- however there was never any problem with photography at all. Thanks to Rhys again for the company and persuading me that we needed a trip of less than 48 hours to France!